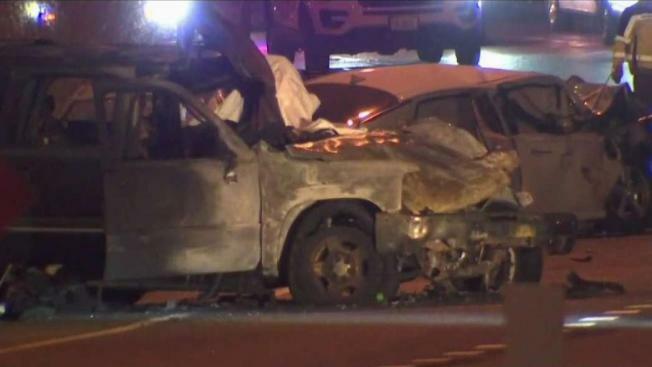 Two people died and more were hurt in a fiery four-car crash that shut down the southbound lanes of Interstate 295 for hours on Friday, police say. Police say about 2:45 a.m. someone drove a Kia Optima the wrong way on southbound I-295 and collided head-on with a Mercedes Benz before striking a Toyota Corolla. The driver of Chevy Suburban who was also going southbound tried to avoid the crashes and lost control, crashing into a concrete barrier, police said. Fire crews arrived at the scene near Howard Road and found a vehicle on fire with several people trapped inside, D.C. firefighters said. The driver of the Chevy Suburban died at the scene and the Kia Optima driver died at the hospital a short time later. D.C. police identified the two victims as 36-year-old Lance Antonio Way, of Silver Spring, and 53-year-old Audrey Wimbish, of Southeast. Police did not clarify what cars each victim was driving. A passenger in the Suburban and the occupants of the Mercedes went to the hospital with non-life threatening injuries, police said. Video from the scene shows two cars with considerable damage on the shoulder of the road and another car that crashed into the median. An SUV appears to have some fire damage. Debris was strewn across all lanes. Crews started moving cars off the road before 7 a.m. and reopened the road before 8 a.m. All traffic on southbound I-295 is being diverted over the 11th Street Bridge.